A statement like this may indeed be a big talking point when Statistics Canada releases the results of its monthly Labour Force Survey on Friday. While a million more people at work sounds like a lot, the Canadian population has also increased by roughly the same amount with the result that the fraction of Canadians working has been pretty well unchanged for the last five years, and has yet to return to rates before the recession. 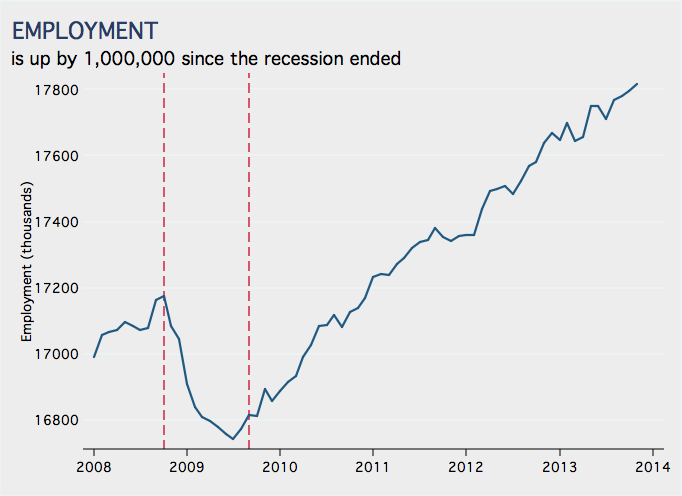 A million is a big number, but it’s not enough to signal a complete recovery from the recession. If the past is any guide, the Statistics Canada press release will lead with a picture that looks something like this. The data are to November 2013, with the dashed vertical lines bracketing the business cycle recession. Source: Statistics Canada, CANSIM Table 282 0087. This gives the impression of very strong growth, with all the jobs lost during the recession recovered by 2011 and many more added since. And it would appear this impressive employment growth is good reason to shift public policy priorities from job creation to balancing government budgets, and even striving for surpluses. But if these same numbers are expressed as a fraction of the (working age) population, then the same picture looks like this. From this perspective employment growth has not been particularly robust, barely keeping up with population growth and with no suggestion of bouncing back. Employment growth during the last five years has been roughly equivalent to the number of immigrants that have entered the country over the same period. Indeed, the recent economic recovery is no more notable than the recovery from the last recession in the early to mid 1990s, and weaker than that from the recession of the early 1980s. The data are to November 2013, with the dashed vertical lines bracketing business cycle recessions. Source: Statistics Canada, CANSIM Table 282 0087. 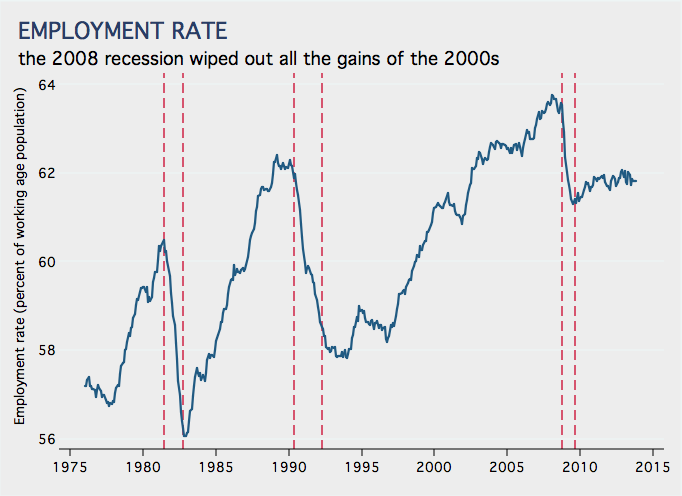 Since there is little sign that current rates of employment and unemployment are generating general increases in wage and price inflation, then it would seem that a full recovery from the great recession has yet to be made. Even if the employment level is easier to communicate and has more resonance because it draws our attention to the lives of actual people, on its own it doesn’t tell macro-economists if the economy has reached its full potential: it offers no indication of whether it is time to turn the corner from promoting job growth to putting a break on it by running surpluses. “Employment in Canada is up by a million,” … but that is hardly enough. 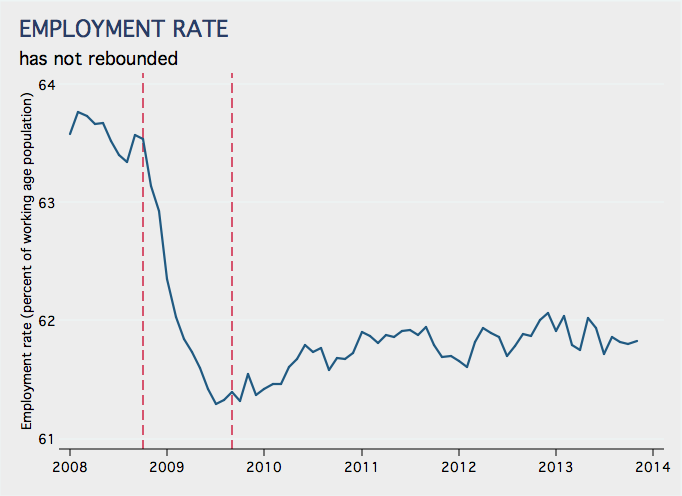 While this statement from Statistics Canada actually IS good news – RELATIVE to recent experience – the real question is HOW MUCH good news we actually need in order to be convinced that our unemployment and under-employment problems are fully solved. In addition to the very important and fundamental points that Professor Corak makes here, there is a huge problem in Canada involving people wrongly labelled and described as having “…given up looking for work…” or “…dropped out of the labour force…” – who are actually unemployed in real terms, but not counted amongst the so-called “official” unemployed. I have commented on this before and elsewhere. See my website at http://www.unempgeninfo.com Robert T. Chisholm – Associate Member, O.S.P.E. Hi Mr C, is this a rebuttal to your post, or not? I’m an economics neophyte so much of it leaves me with a frown on my face.But i’m struggling to understand how all this fits into the equality debate. It seems you and Mr G are pretty much on opposite sides right now. Curious to hear your view point. Unfortunately Mr G fobbed me off with a reminder to beware confirmation bias. Why hasn’t the output gap closed despite stimulative monetary policy and the unemployment rate decreasing? Miles Corak outlines the employment situation. At this point, in general I don’t understand Ken’s comment – but much appreciate his reference to the Macleans article, which raises additional points that should have been addressed properly long ago.